Location, Location, Location! 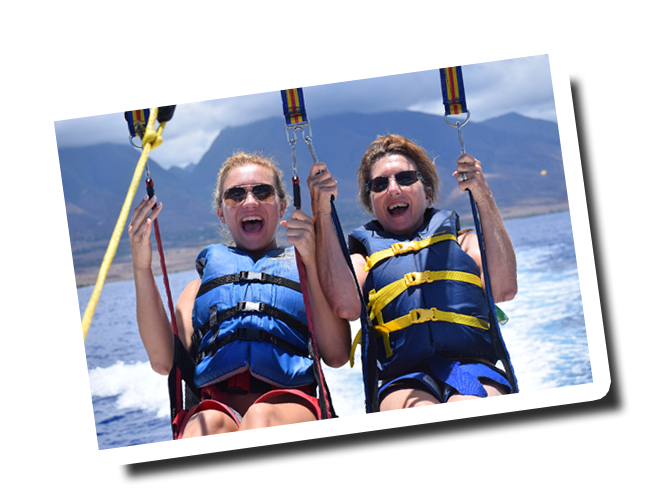 We are so very fortunate to be able to operate our Parasail operation in one of the most beautiful places on the planet, Maui’s Historic and Scenic West Side. Whether you are flying out of our Lahaina Harbor location and getting a birds eye view of Historic and scenic Lahaina Town and our neighboring islands or if you are flying off of our Ka’anapali Beach location with amazing views of Ka’anapali Beach, West Maui Mountains and the neighboring islands you will see why so many people visit our beautiful island. We have Two Convenient Locations. Our first location is in Historic Lahaina town at Lahaina Harbor Slip #15. There is lots of parking in Lahaina as well as many places to shop or eat lunch prior to or after your Parasail ride. There is a public parking lot on the corner of Front St. and Prison St. with 3 hours free parking. To find our location with a GPS, type in 675 Wharf Street and that will bring you right to scenic Lahaina Harbor. You should be able to find parking in many places around this area. Please come early to find parking as well as 30 minutes prior to our location to check in. Our second Parasail location is on the famous Ka’anapali Beach. 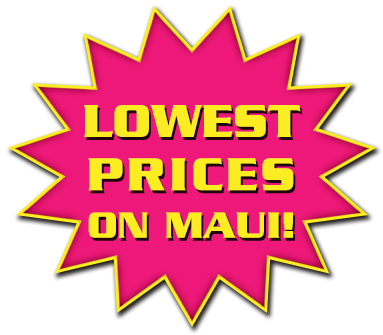 We are located on the Beach in Ka’anapali and load and unload our customers at the ingress/egress loading area in front of Whalers Village. Park at Whalers Village multi level parking garage and walk out to the Beach in front of Whalers Village and look for our Yellow umbrella’s with the Smiley faces and WEST MAUI PARASAIL on them. 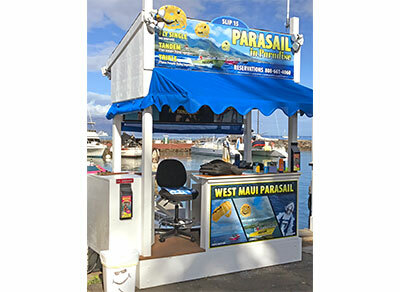 We also have a yellow shuttle boat with WEST MAUI PARASAIL on it. 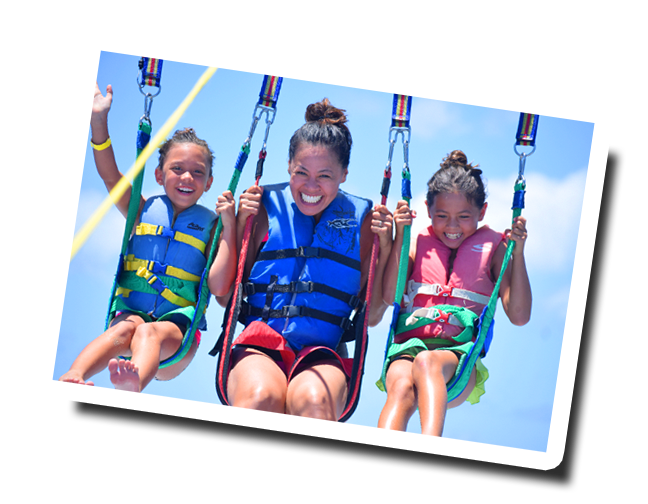 Our friendly staff will be more than happy to answer questions while we check you in for your Parasail ride. Parking can be found at the Whalers Village Shopping Center or at any of the Hotels Beach Parking Spots. We do not validate for parking. 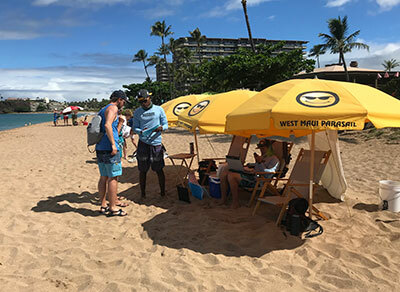 To get to our Ka’anapali Location via GPS type in 2435 Ka’anapali Parkway, Lahaina, HI and that will take you to Whalers Village, you can park there and then walk out to the beach and look for our yellow umbrellas. Please come early to find parking as well as 30 minutes prior to our location to check in. 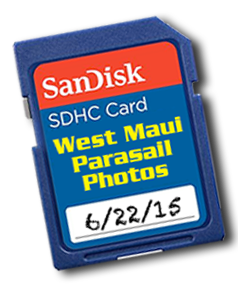 West Maui Parasail offers a Digital Photo package of 30 – 50 pictures. We take pictures on your take-off and get the close-up shots, touch-n-go pictures, up at elevation and also during the landing. 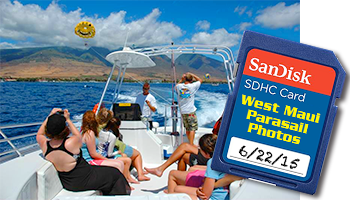 We give you a SD -Card of all your pictures that you get to keep and do with as you choose. Sales desk and boat dock at Slip 15. SEASONAL: We operate every day from May 16 through December 14 each year. The migration of the Humpback Whale through the Hawaiian waters prevents us from operating year round. Please call us for more information about large groups or customers with special needs.